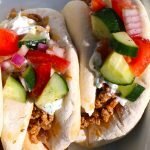 Greek wraps with ground turkey and homemade tzatziki sauce. Topped with tomatoes, cucumbers, and red onions, this is a delicious and healthy recipe for lunch or dinner. Greek wraps are such a great way to spice up your dinner rotation. There many different ways to make a greek wrap. Common Greek wrap ingredients include meat cooked on a vertical rotisserie, pita bread, and Tzatziki sauce. Pork, chicken, and lamb are the most popular meats for Greek wraps. I used ground turkey as a healthy alternative for my meat selection and loaded this wrap up with healthy veggies (tomatoes, english cucumbers and red onions). Making homemade Tzatziki sauce was quick and easy, and really makes this recipe. 1. You will need a box grater for the Tzatziki sauce. I grated the cucumber on a box grater with the largest holes. Then after the grating, I strained the cucumber pieces for 20 minutes, then pressed paper towels down on the cucumbers to soak up the water, before mixing with the other sauce ingredients. 2. For the bread, you can make homemade pita bread, use store bought pita bread, or soft taco size flour tortillas. 3. 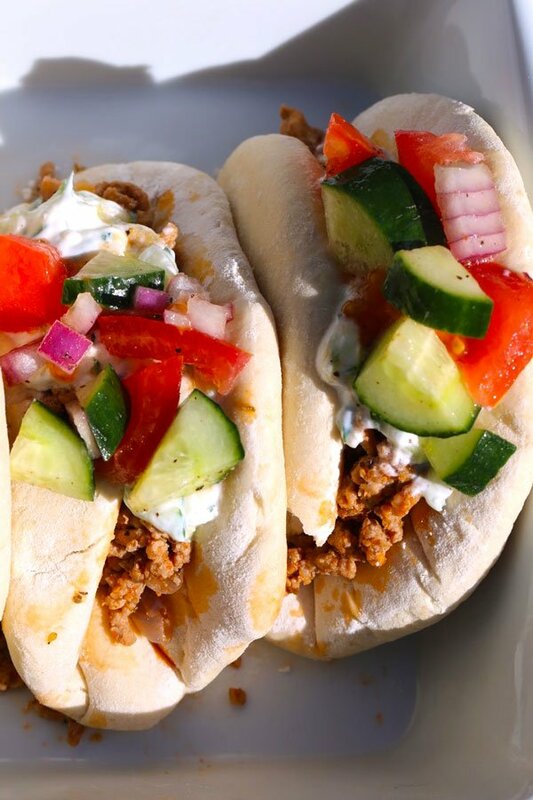 The mixture of ground turkey, Tzatziki sauce and tomato cucumber salsa is so tasty, you can forgo the bread, and serve with a side of jasmine rice or rice pilaf. Any scenario would be delish. Gyros. Gyros are a Greek dish with pita bread, meat, tomato, onion and Tzatziki sauce. They can be! If you are using a fatty cut of meat with few veggies, the nutritional value goes down a bit. However, with a lean meat, lots of veggies and fresh Tzatziki sauce, Greek wraps can be a very balanced meal. And, delicious too! 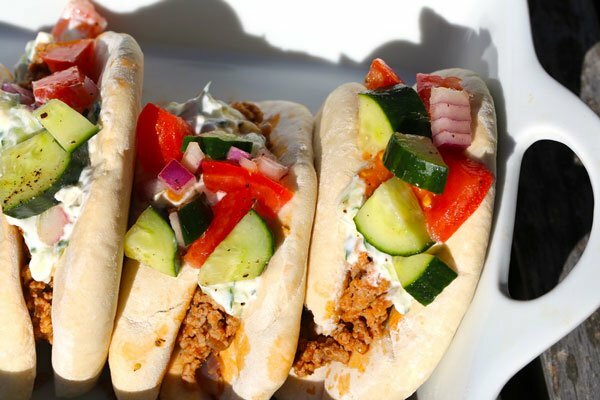 SAVE THESE GREEK WRAPS TO YOUR “DINNER” PINTEREST BOARD! Toss the olive oil, red wine vinegar, tomatoes, cucumbers and onions in a bowl and sprinkle with salt and pepper. Cover bowl and refrigerate for at least an hour or up to 24 hours, to let the flavors mingle. Using a box grater, shred the cucumber on the largest hole side of the grater. Place cucumber pieces in strainer, and sprinkle with salt. Let sit for 20 minutes, then using paper towels press and squeeze out the excess water on the cucumbers. Place cucumbers in a bowl and add in greek yogurt, feta cheese, garlic, salt and pepper, and any optional herbs you'd like to add. Stir ingredients together, cover bowl, and place in refrigerator until ready to use. Stir in tomato sauce, chicken broth, and oregano. Bring mixture to a boil, then reduce heat to a simmer for 6-8 minutes. Serve with pita, side of rice or hummus. Enjoy! !